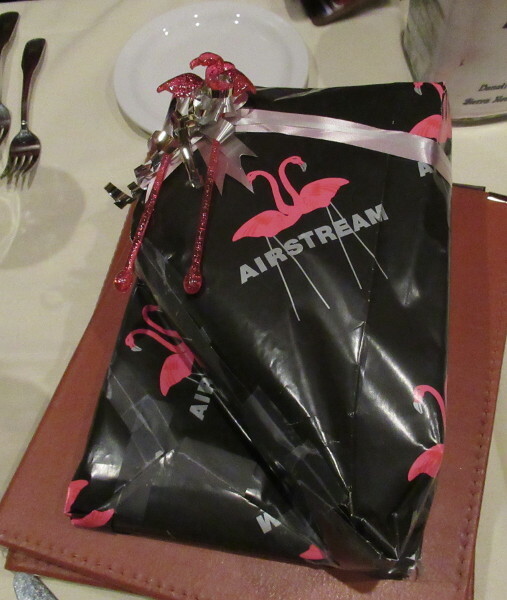 At Portofinos in Reno, here’s the door prize for the SNU gathering. 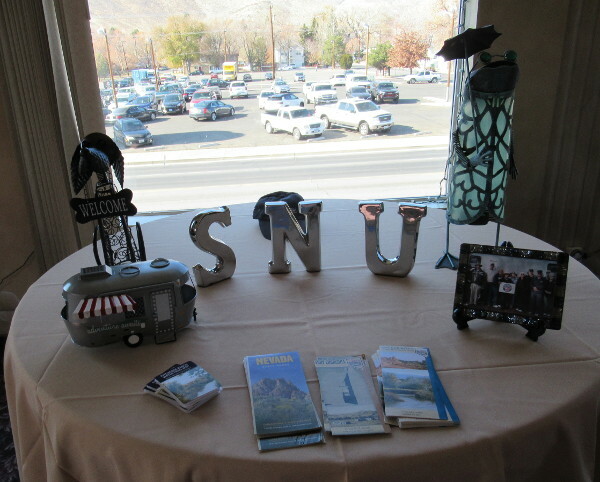 Then there’s the SNU Lunch at the Carson City Plaza November 2018. Jason Noel thinks Big Daddy RV’s in London, Kentucky is similar to another dealer link. Their RV Parts Country makes big claims that might be worth checking out in trying to find what you need on your next repair and refurb job. Open Culture notes a copyright expire date in 11,000 Digitized Books From 1923 Are Now Available Online at the Internet Archive. You can not only find free books but also courses and language lessons and movies and other media for your library. Fort Churchill anchors one end of the Nevada State Parks Carson River run that extends to the Lahontan reservoir. The SNU held its October rally there, See the SNU Fort Churchill page for links to photo galleries. The group took a day trip to visit NSP’s latest river run, the Walker River State Recreation Area. Check out the photo galleries and links! The area is on the East Walker as it runs from Bridgeport to Yerrington between Sweetwater summit and Walker Lake. NSP acquired land from several ranches in the valley for its recreation facilities and river access. beautiful September weekend. The oak trees were showing hints of fall colors. Sky was clear. Temperatures mild. Facilities excellent. So too, people and food and, even, a troubadour to lead with song an guitar at the gathering around the campfire. check out the photo gallery links on the information page! See the photo galleries and links to additional information! A gathering in an old mining community. 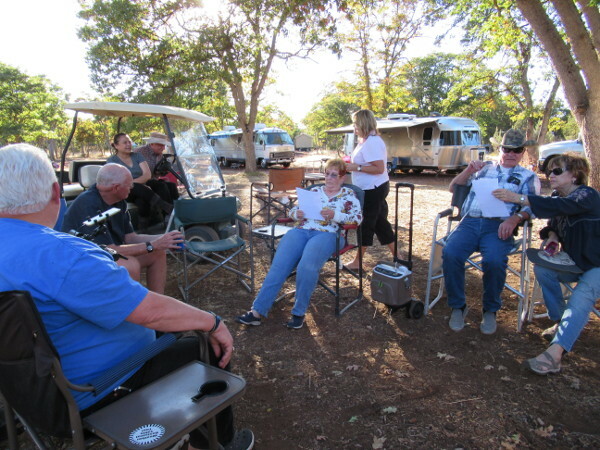 The SNU May Rally met at the Crocker Campground for a relaxing weekend in the pines with friends. Here is a document about the road project prepared for Plumas County. For a rundown on historical markers in the area, see the Plumas County Museum Association newsletter. 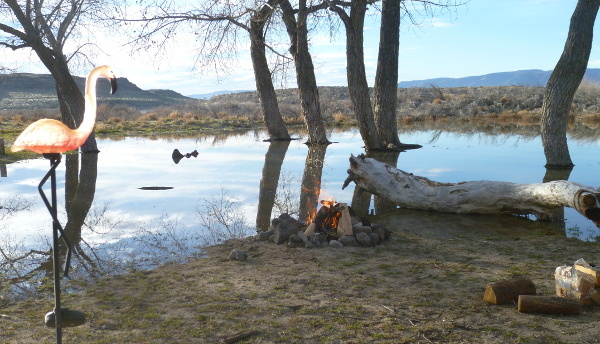 Although plans are nebulous at this time, there has been talk of having an impromptu campout at Rye Patch Reservoir East of Lovelock either before or after the luncheon. Whether or not this occurs depends on weather and other factors. If you are interested let us know. October weather! Warm for prep, gusty with rain and cold on first night out then sunny afternoons and warming. Thursday October 19 to Sunday October 22, 2017 the SNU rally will be at Boca Rest near Truckee, CA. Take the Hershdale exit off I 80 head north over the bridge and past the dam. Continue around the east side of the reservoir about a half mile. The campground is just off the road on the left. Also – See the Pictures! This isn’t the usual full service RV resort. They have a number of features to make a rally something special, including this layout. The WBCCI is expecting the 2018 International in Salem Oregon to fill up as did this year at Escanba. It's the perfect location to get a large contingent of Sierra Nevada Unit members at an International. Register now to make sure of a spot with water and electric. The July rally will be at the full service RV park in Weed Heights Thursday July 20 to Sunday July 23, 2017. 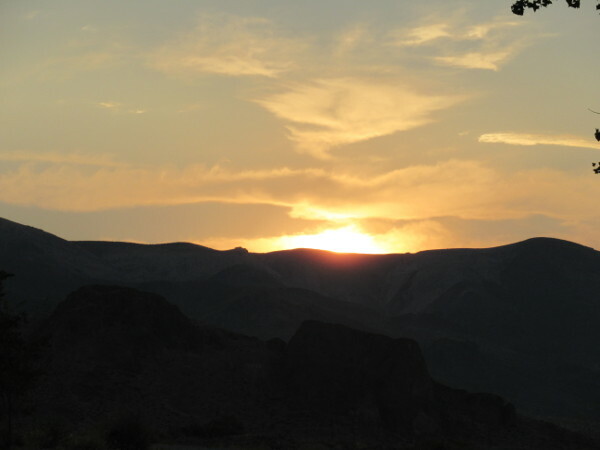 The RV park is located in the Township of Weed Heights just west of Yerington, NV off Hwy Alt 95. Dinner plans include Jerry’s famous Nevada surf-n-turf BBQ on Friday with ice cream for dessert. Hope to see you all at Weed Heights. RSVP’s  phone: 775 972 9392 or Email: hq@sierranevadaairstreams.org. If you can’t come for the whole rally, come for a day or come for a visit whatever fits your schedule. June the SNU rally will be at Crocker campground Thursday June 22 to Sunday June 25, 2017. 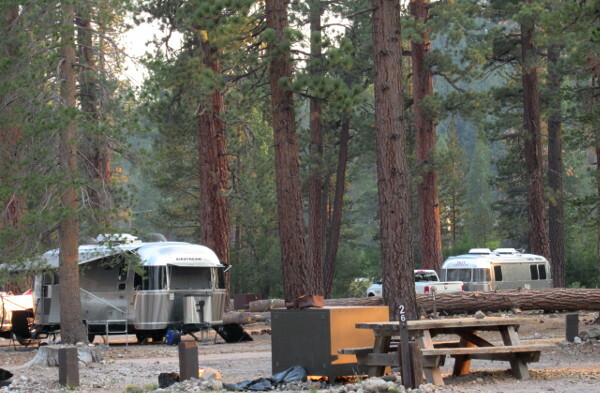 Crocker Campground is off of Highway 70 at Beckwourth, CA. At Beckwourth (coming from US 395 and Reno) turn right on Rt 177, the Beckwourth-Genesee Road. The campground is about ten miles up the road. On Friday we will visit a nearby Farmer’s Market and be depending on how it goes, we might have a dinner of Farmer’s Market products on Friday. Plan to join us. RSVP’s  phone: 775 972 9392 or Email: hq@sierranevadaairstreams.org. If you can’t come for the whole rally, come for a day or come for a visit whatever fits your schedule. The pictures are up! The rally this time was at the North Eagle Lake BLM campgound. See the Eagle Lake Rally Page for gallery links and other information. This from collection #2 – See the photo gallery! The link to collection #1 is on the Eagle Lake Rally Page. 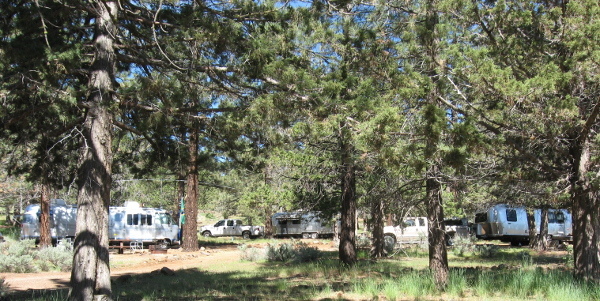 The campground is ‘old style’ BLM which means the camp sites tend to be rather small and maneuvering rather difficult. Phil, the host, says this rally had more campground visitors than he’s seen before. It’s usually a quiet place without too many visitors. The California DOT has quite a rundown on CA 139 (PDF) which is the route from Klamath Falls to Susanville and goes by Tule Lake and the Lava Beds National Monument before it gets to Eagle Lake then over Antelope Pass to Susanville. The scenery is special but the road is rather difficult for larger, modern RV’s as the lanes are narrow and shoulders nearly non-existent. It is an old road. Silver Fox took note of the High Water Across the West: Honey Lake with a lot of pictures. She has links to pictures of the lake from previous years, too. 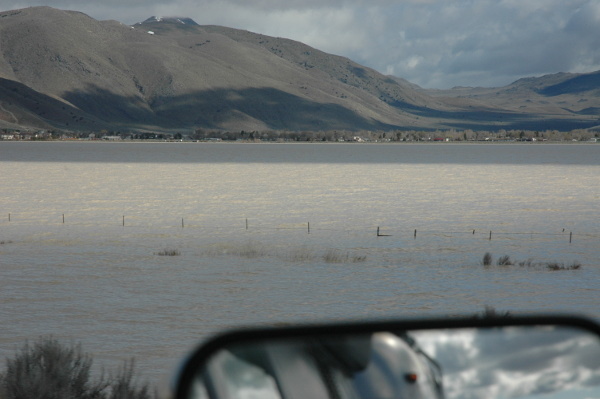 I’ve recently had the opportunity to travel across part of the Great Basin of eastern California and northern and central Nevada, and have noticed a lot of high water, almost everywhere. Honey Lake, which has been dry to only partly filled during the last several years, is once again a lake. There’s also a new photo gallery: 2017 – A wet year in Northern Nevada with pictures of the ‘dry’ lakes on U.S. 395 north of Reno (but south of Honey Lake). Here’s White Lake near Cold Springs and Bordertown as seen from the freeway. The rally this weekend will provide some more pictures of Honey Lake and Eagle Lake so stay tuned! The May 2017 Newsletter has been posted — Links to photo galleries and additional information mentioned in articles in this newsletter can also be found there. Thursday, May 18 to Sunday, May 21, 2017, the SNU rally will be at the BLM Campground at Eagle Lake. 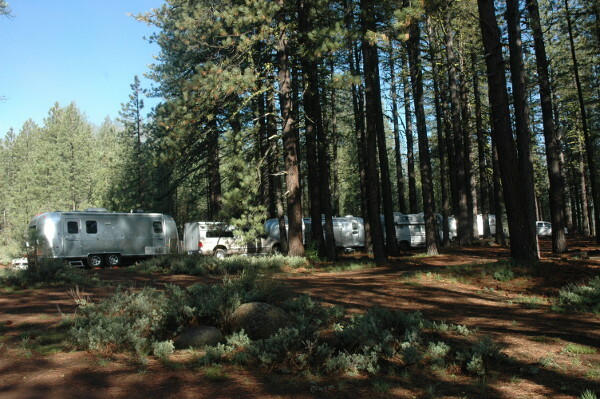 The campground is 30 miles north of Susanville on Highway 139 and a half-mile west on Lassen County Road A-1. Thursday we will have a salad and sandwich dinner. The SNU will provide the bread so rally participants should bring sandwich fixings and/or a salad. Saturday we will have a Mexican inspired dinner. Let us know if you plan to come so we can make sure we have enough tacos and other goodies for you. RSVP’s phone: 775 972 9392 or Email: hq@sierranevadaairstreams.org. If you can’t come for the whole rally, come for a day or come for a visit whatever fits your schedule. The April 2017 Newsletter has been posted — Links to photo galleries and additional information mentioned in articles in this newsletter can also be found there. Thursday April 20 to Sunday April 23, 2017 are the dates for the SNU rally at Ft Sage near Doyle. Be sure to access Ft Sage from Laver Crossing road which is 2 miles from the north end of the Doyle loop. The route provided by a lot of GPS programs from the south is NOT RECOMMENDED for RV’s (unless the bridge has been repaired). 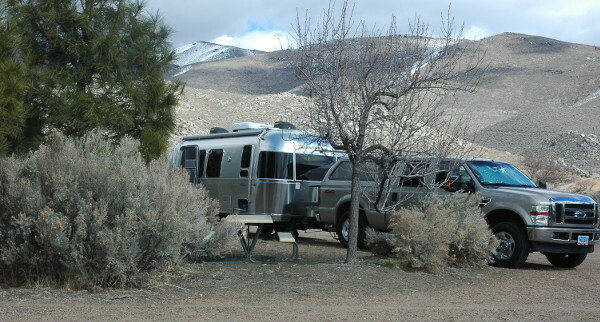 Ft Sage is a BLM campground and off road trail head. The trails are great for hiking and bike riding as well as off road vehicles. Bring wood for campfires RSVP’s appreciated and helpful. phone: 775 972 9392 or Email: hq@sierranevadaairstreams.org. If you can’t come for the whole rally, come for a day or come for a visit whatever fits your schedule. The SNU rally at the Lahontan Nevada State Park Beach 7 in March 2017 was a nice weekend given usual Nevada spring weather. The big event was watching the lake level rise as water was held to allow spillway maintenance. That put the kibosh on the campfire after the first morning as the fire pit was drowned. See the rally page and the destination page for more about the event and the place. Some of the new or updated photo galleries include Lahontan Scenery -|- Lahontan water levels 2012 and 2017 -|- The Disappearing fire pit -|- Lahontan Review 1996 to 2017. Here’s the view towards the lake. The water is part of an inlet with the major part of the lake over the berm in the upper part of the picture. The lake is a reservoir fed by the Carson River and the Truckee river via the Newlands Project. It is used to irrigate farmland near Fallon. The excess goes into the Stillwater Wildlife Refuge and there has been work done on US 50 and US 95 to provide culverts and other preparations anticipating a record runoff from this year’s snowpack in the Sierras. The March 2017 Newsletter has been posted — Links to photo galleries and additional information mentioned in articles in this newsletter can also be found there. March Rally at Lahontan — Thursday March 23 to Sunday March 26, 2017 are the dates for the rally at Lahontan beach 7 structured campground. Turn right at the end of the paved road to get to the campground. The campground itself has nice paved roads and parking sites. We are planning on a Pizza Party for Thursday dinner. Bring wood for campfires RSVP’s appreciated and helpful. 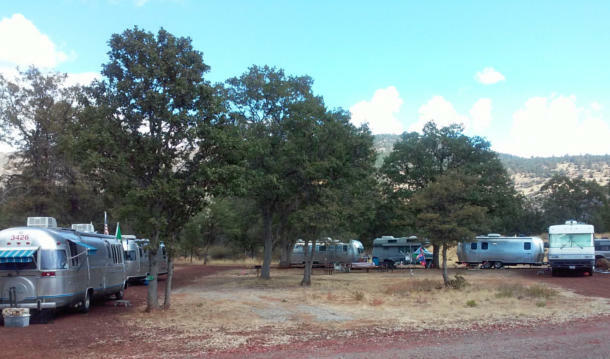 phone: 775 972 9392 or Email: hq@sierranevadaairstreams.org. If you can’t come for the whole rally, come for a day or come for a visit whatever fits your schedule.